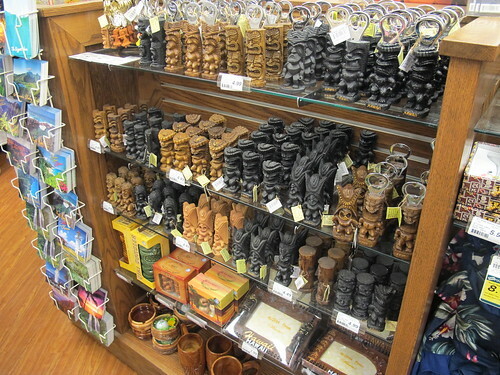 Not Just Food at Foodland…Tikis Too! 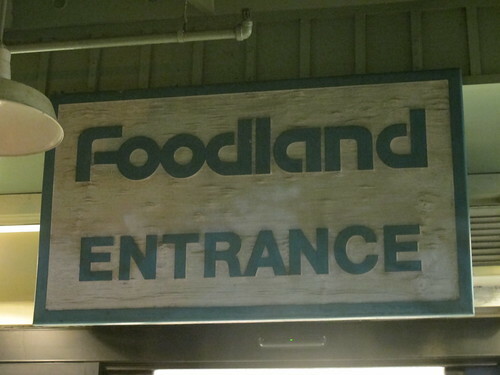 While we were staying at the Westin on Kauai, the Foodland in Princeville was our go-to grocery store. Well, it’s really the only game in town, but they get big bonus points for all the different kinds of delicious poke they serve at the deli counter. 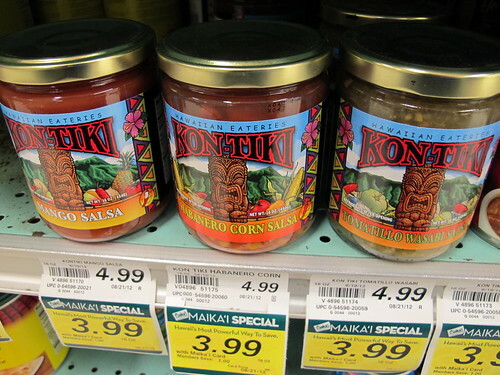 Foodland also stocks products made from Hawaiian companies, including some that feature tikis in their designs, like Hawaiian Eateries Kon-Tiki salsas. 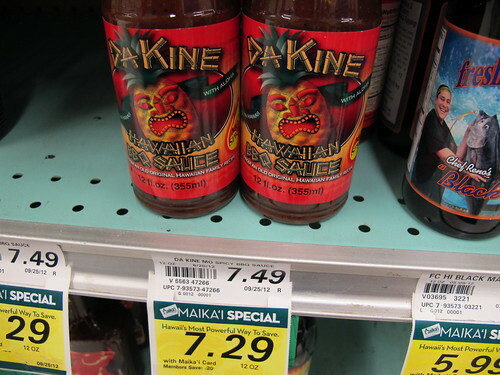 Meanwhile, the label for Da Kine Hawaiian BBQ Sauce had sort of a tiki-pineapple hybrid. It reminded me of the pineapple jack ‘o lanterns tiki folks carve at Halloween. In the souvenir section I stumbled upon this tiny army of probably imported tiki figurines, keychains, bottle openers, frames and mugs. Nothing too notable about them, I was just a bit surprised to see so many. 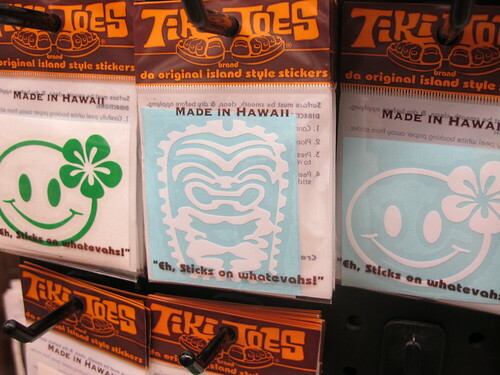 Then I turned around and saw these stickers from family-owned, Kauai-based company Tiki Toes. This stylized Ku is just one of their neat tiki designs — you can see several more on their web site. 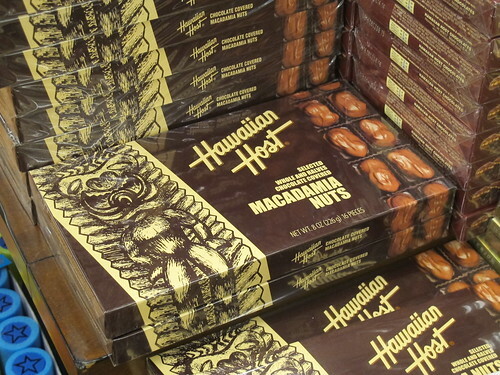 And how could you go to Hawaii without buying some chocolate covered macadamia nuts? Might as well pick the Hawaiian Host box with the big tiki on it. 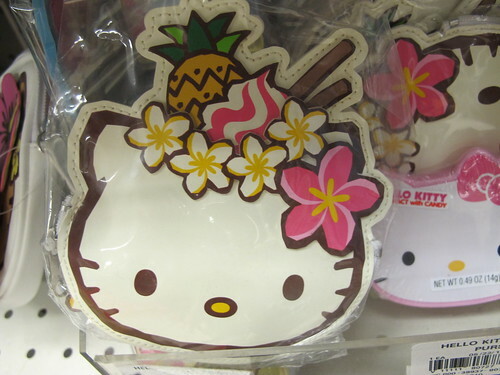 While not truly tiki, I also liked the Hawaiian-style Hello Kitty stuff they had, this cute coin purse most of all. Aloha, everybody, and Happy Friday!